For those proclived to exercising and mowing. This creation lies somewhere between an exercise bike and a ride-on mower. 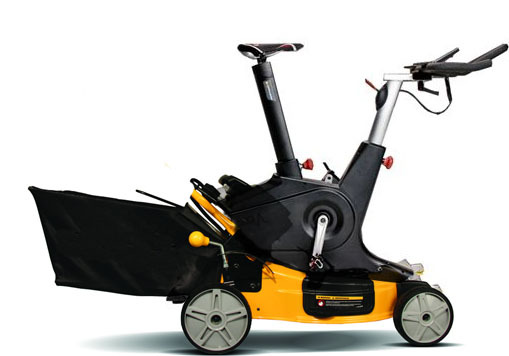 Geared so as to give a top speed in the tortoise-class, this monstrosity uses the same high-speed vertical-axis blades as conventional ride-on mowers, guaranteeing a clean cut and a thorough workout. Do something (albeit slowly) with your exercise energy! Cut your grass in a way that's environmentally friendly! Don't eat meat! Buy a Prius! Kill your pets! I'm well aware that human-powered, and pedal-powered mowers have been tried and tribulated before, but I must stress that the goal here is not a mown lawn, but a tired and frustrated customer. At the very least it is an artwork, a commentary on the futility of human endeavour. This is probably a better idea than it sounds, although only suitable for those with fairly large lawns due to manoeuvering issues. Some sort of hybrid pedal-electric drive would probably work. Haha, got to laugh at "kill your pets". Most lawn mowers have 4 or 5 horsepower engines. A human in top physical condition can exert about 1/3 HP for short periods of time. It is going to take quite a while to mow a lawn this way. Maybe you should change the category to Performance Art. Or, keep sheep as pets. // It is going to take quite a while to mow a lawn this way.// At the risk of disagreeing, I disagree. Push mowers work perfectly well, despite note being optimally designed. Therefore, I suspect that a human-powered ride-on mower would be at least as effective as a push mower, and probably more so, given that it would make better use of the leg muscles. Put it another way. Cutting one blade of grass with a sharp blade should take about 100µJ of energy (making a few reasonable assumptions). Assume 10^5 blades of grass per square metre, that's 10J/m^2. Given a relaxed output of 30W, that's about 3 square metres per second. You need to factor in the energy to move the machine along, but one square metre per second ought to be easily attainable. This means that you ought to be able to mow a croquet lawn in about 20 minutes. Given that many people only _have_ the one croquet lawn in the first place (and probably don't even have a second place), the weekly time expenditure is quite reasonable. Most of the extant versions appear to simply append a typical reel type push mower to a bicycle. However, I don't see any reason it couldn't be done with a deck type mower, as long as the gearing for the blade was sufficiently absurd. As with any human powered mower, you'd want to spend more time making sure the blade was sharp than you do with a power mower. //I hear goats make good mowers// I doubt that very much. Even assembly from ready-made components requires a degree of dexterity which is unlikely to be found in a ruminant. Are you capriphobic? That is exactly the kind of parochial attitude that prevents these docile little creatures from receiving the respect and dignity they deserve. Yes, their inability to stay focused on simple tasks combined with their complete lack of opposable thumbs (or lack of ANY thumbs, for that matter) doesn't help their cause, but it isn't fair to simply write them off. Has anyone REALLY tried the *thousand monkeys with a thousand typewriters* thing? I know a goat isn't a monkey, but who is these days? All I'm saying is we should we give them an opportunity and see if they fail. my local gym has gone off grid and is now entirely powered by the customers. first one to arrive in the morning has to cycle in the dark for a while though.